The following figure shows a simplified block diagram of the NI USRP-2900. The RF switch allows transmit and receive operations to occur on the same shared antenna. On the USRP-2900, one antenna is designated receive-only. The bandpass filter reduces noise and high frequency components in the signal. The downconverted samples are passed to the host computer over a USB 3.0 or USB 2.0 connection. The host computer synthesizes baseband I/Q signals and transmits the signals to the device over a USB 3.0 or USB 2.0 connection. 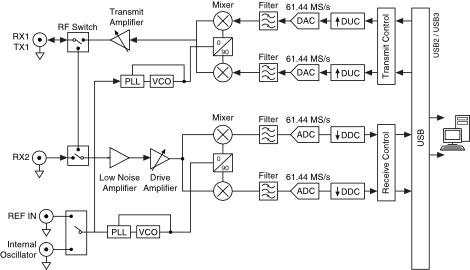 The digital upconverter (DUC) mixes, filters, and interpolates the signal to 61.44 MS/s.